To meet the needs of musicians performing early music, we have introduced the Jay Haide à l'ancienne Baroque violin. These violins have been handcrafted and set up to exact Baroque specifications and provide the musician an opportunity to own a fine Baroque instrument at a reasonable price. We feel sure that the Jay Haide Baroque violins will be popular with professional Baroque musicians as well as any musician who wants to experience the joy of playing the music of Bach, Vivaldi and Handel as it was originally performed. To meet the needs of musicians performing early music, we have introduced the Jay Haide à l'ancienne Baroque cellos. These instruments have been handcrafted and set up to exact Baroque specifications and provide the musician an opportunity to own a fine Baroque instrument at a reasonable price. We feel sure that the Jay Haide Baroque instruments will be popular with professional Baroque musicians as well as any musician who wants to experience the joy of playing the music of Bach, Vivaldi and Handel as it was originally performed. 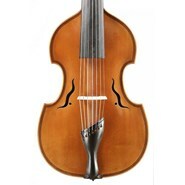 The Jay Haide á l'ancienne Violoncello Piccolo is available in a baroque setup in both 7/8 and 3/4 sizes, with full size ribs to project a full and even tone from the low C to the top E string.